Place the lasagna noodles in boiling water, add some salt, and cook them for about 10-15 minutes until they are almost done. Drain the water and lay the noodles flat on your working table until they cool down. If you don’t have ready-to-use Marinara sauce, you can make it yourself. Heat olive oil over medium heat in a saucepan. Add crushed garlic and finely chopped onion. Saute until golden, then add skinless chopped tomatoes, half a teaspoon of Italian seasoning, and salt and pepper to taste. Stir the sauce frequently and cook it until it bubbles. Separately brown the ground beef with the minced onion in a saucepan. Stir continuously until it is well done. When the meat is done cooking, add salt and pepper. Add the sauce to the beef, reduce the heat to low, cover your saucepan with a lid, and simmer it all together for about 5 minutes. 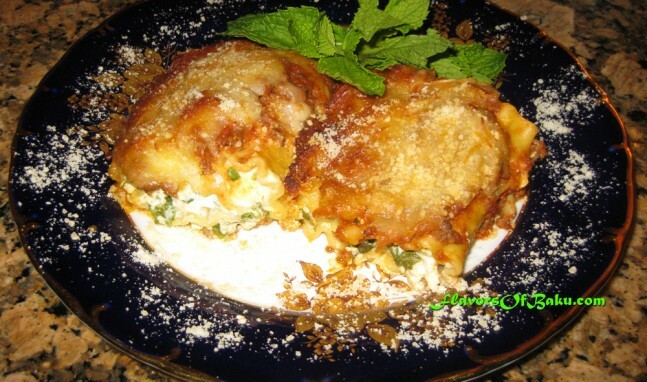 In a large bowl, mix together 1½ cup ricotta cheese, 1½ cup mozzarella cheese, and 2 cups chopped spinach. 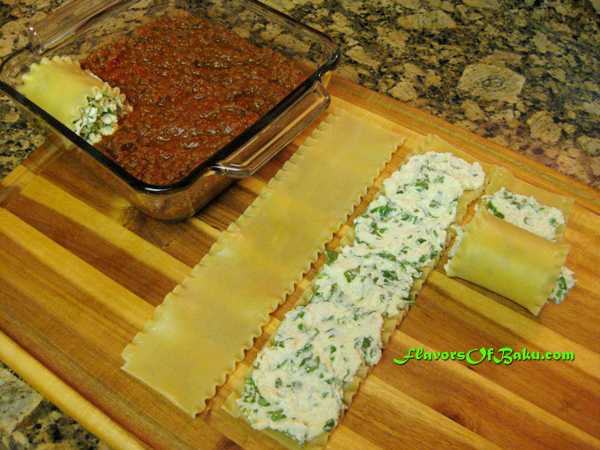 Spread the filling mixture evenly onto the noodles and tightly roll them up. 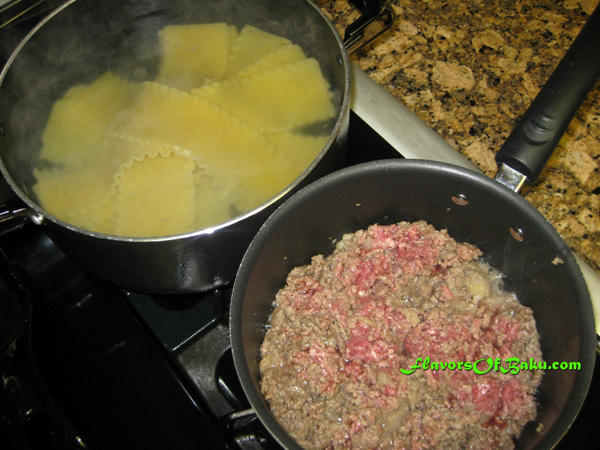 Pour half of the meat sauce into a baking pan and place the rolled up noodles on the sauce side by side. Pour the remaining meat sauce over the noodles. 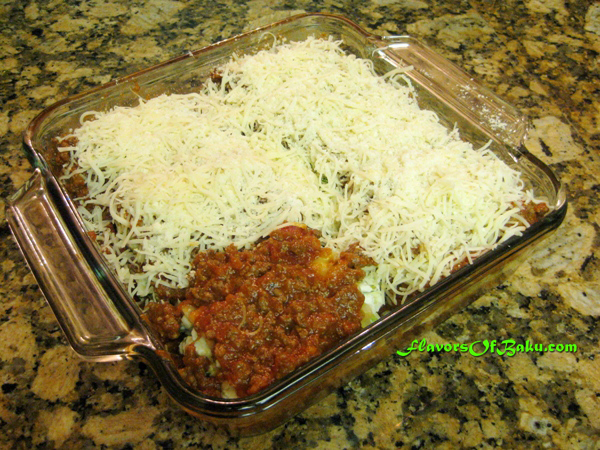 Spread the rest of Mozzarella cheese evenly and sprinkle Parmesan cheese over the top. 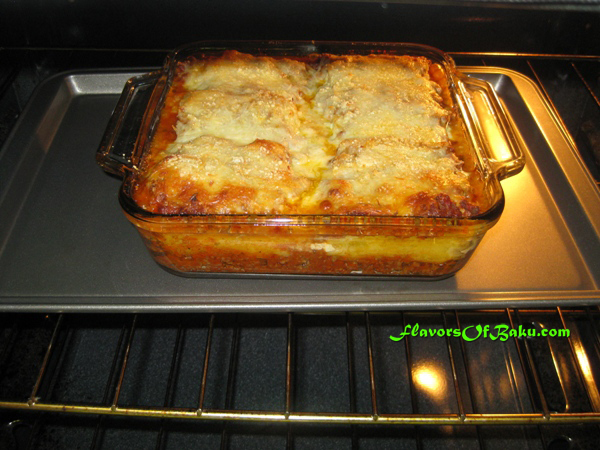 Cover the baking pan with foil, preheat your oven to 350°F (180°C), and let the lasagna cook for about 30 minutes. After it’s done cooking, uncover the pan, raise the temperature to 400°F (200°C), and cook it for another 10-15 minutes until cheese is golden.